The Gourmia GTA1500 Digital Electric Air Fryer, Griller and Roaster With Calorie Reducer Technology comes with a capacity of 10 liters or 10.5 quarts. When you buy the Gourmia GTA1500 air fryer for healthy oil-free deep frying, you also get to use it as a grill, steamer, convection oven, air sauté and rotisserie. It sure does sound like a value buy versatile home kitchen fryer. Now, if you have a small kitchen, you’ll really appreciate such a useful modern kitchen appliance that allows you to cook your meals in so many different ways. Just imagine the money and space saved with this one machine instead of buying a separate grill, fryer, wok, steamer etc. and yes, it can even act as a popcorn machine! The Gourmia air fryer cooks food faster by 60% compared to conventional cooking methods using the oven, grills. In this fast paced world, that does sound appealing. 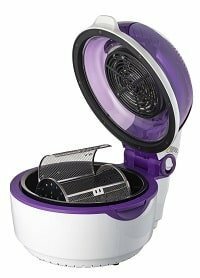 This hot air fryer machine cooks using rapidly moving hot air and not oil or fat. All your favorite greasy food can now be low fat with reduced calories made possible using the Gourmia air fryer with its calorie reducer technology. The Gourmia 1500 heats up the air using halogen bulb. A fan blows this heated air rapidly around the enclosed cooking chamber. Cooking by using hot air 360° and not hot oil as in deep fat frying ensures a calories reduced meal each time. This Gourmia FreeFry 360° Turbo Cook Center uses the radivection cooking system. There is an on/off digital control. These come with preset time and temperature. There is a roll button for rotation function as well as manual temperature and timer control button. You can choose the preset button or set your own desired time and temperature. You can roast a whole chicken in this air fryer using the rotisserie fork accessory. You can cook frozen fries, nuggets etc. straight from the freezer. You can even effortlessly cook popcorn using the rotisserie basket or cage. Cookbook is not included, only a manual. It comes with a delay timer up to 10 hours. The time range is from 1 – 60 minutes. Temperature range is from 120 degrees F – 450 degrees F.
This Gourmia 360° turbo cook center comes a removable inner non-stick bowl for cooking. The starfish pattern at the bottom of the bowl ensures efficient flow of the heated air 360 degrees around the food ingredients. 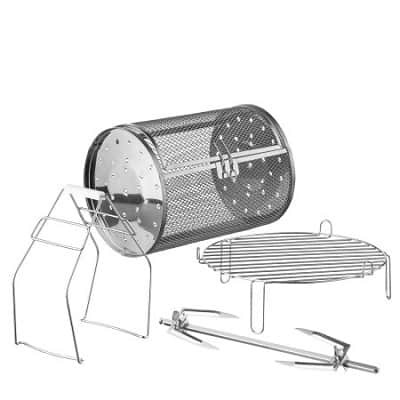 There are 4 included accessories – rotisserie basket or food roller, auto rotating classic rotisserie fork, high and low broil and steamer rack and tongs. It is suitable for smaller food items such as fries. The rotating or rolling feature ensures even cooking. The basket can also be used when using the stir-frying feature. It has a locking hinge to prevent accidental opening or spilling of the food while cooking. Used when roasting a whole chicken or a large piece of steak. The rolling function makes it easy to apply sauce evenly to the chicken during the roasting process. As the chicken rotates, you brush the sauce on the bird. This high and low rack is actually the same rack. It comes with longer stands on one side and shorter stands on the other side. You use the low rack for larger food items such as lamb chop and the high rack for medium size food items. Used when handling the hot food. The appliance comes with a safety lid lock. To open or close the lid, you have to press the white lid lock switch located at the side where the lid joins the main body. This prevents accidental slamming down or opening of the lid whether by you or the kids. When lid is opened, the cooking process automatically stops. Only the start and roll button are still working. Once lid is closed back, cooking continues. When fryer has been in standby mode for 1 minute, it will automatically power off. Fryer has suction feet that grips the countertop and prevents accidental sliding or toppling. Use nylon or polyester mesh pad for cleaning and not steel wool pad as it is too abrasive. The bowl can be cleaned using warm soapy water and a damp cloth. The bowl and food roller or rotisserie basket are dishwasher safe. Compared to the Gourmia GTA2500 with its 11 accessories, the GTA1500 has only 4. 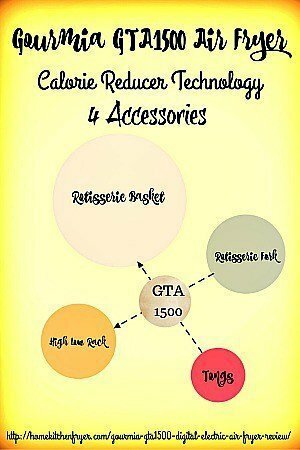 However, with just this 4 types of accessories, you can expand the cooking options of the air fryer by a lot. Customers reviews and comments are mostly positive and talk about ease of use and tasty food. Cleanup was easy too. The common complaint seems to be the lack of a recipe book. This fryer looks similar to the Lidore air fryer except that the Lidore fryer has 2 extra accessories. The rotisserie feature is really a great way to roast a low fat (low calories) chicken. The rotating chicken is cooked evenly without having to stop the fryer to turn the chicken around. The more expensive Philips digital airfryer does not come with this useful feature. 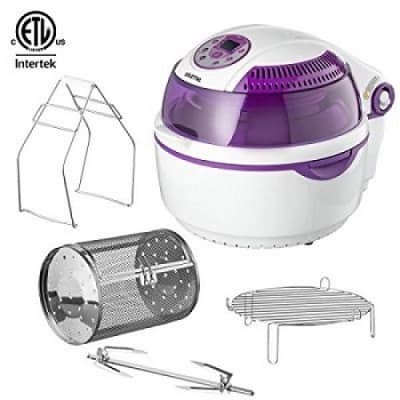 The large 10.5 quarts capacity Gourmia air fryer with its 4 numbers of accessories is indeed a good buy at its sale price, especially when it has the rotisserie fork and basket included. It would be a fantastic gift to your teenage child setting off to college and wishes to eat healthy low fat meals.